It’s more difficult to think of what you couldn’t do here. Otepää is an extremely versatile holiday destination, whatever your interests. There’s really a lot to see, do and experience both in Otepää and its surroundings. Estonia is a small country, so Villa Ottilia is a perfect home base even for longer day trips. Nature here is unparalleled in its beauty. Softly rolling hills, glittering lakes, dense forests and signposted nature trails provide an experience like nowhere else. In winter, go cross-country or downhill skiing, snowtubing, ice-fishing or rent a ski-doo. 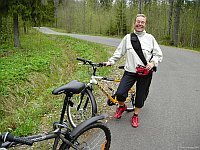 In summer, spend a day on the beach of Lake Pühajärv, rent a bicycle, go hiking or jogging, or just wander along the signposted paths in the forest enjoying the clean air and the smell of outdoors. In all seasons, make day trips by car to many interesting towns and places in the vicinity. You’ll find two spas, beauty salons and massage, can have your nails done or get yourself a new hairdo. There are restaurants, cafés, night clubs and pubs for all tastes, in an intimate small-town environment (there are just 2,400 inhabitants in Otepää). We’ll help you find what you need, whether it’s nature, sports, services or sights. HINT: When planning a holiday in Otepää, do reserve at least a couple of days if not more. The only complaint we’ve had from our guests is that they didn’t realise how much there is to see and do here, so their stay was far too short. We promise we’ll fill your days with a programme you won’t forget!